Fr. Nicola Yanney is one of my favorite priests in the history of Orthodoxy in America. He immigrated to America at age 19, in 1892-93, with his new wife. They immediately settled in, of all places, Nebraska. Nine years later, she gave birth to their fifth child — and died in childbirth, leaving Nicola as a 29-year-old widower with five small children. The new baby died soon thereafter. I am 29 and have three kids, and I cannot fathom how painful and overwhelming this must have been for Nicola. Two years later, the local Antiochian Orthodox community in Kearney, Nebraska asked that Nicola be ordained to serve as their priest. 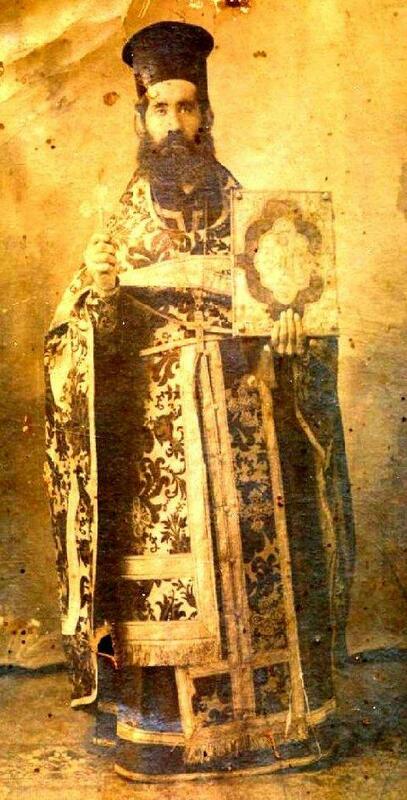 He traveled to Brooklyn, where the newly consecrated Bishop Raphael Hawaweeny educated and ordained him. Fr. Nicola was the first priest ordained by St. Raphael. He might have been the best, too — while continuing to raise his children as a single parent, he traveled all over the middle of the country, visiting Orthodox people in remote areas and performing baptisms, weddings, and funerals. For example, in 1911, he made at least 35 pastoral visits to at least a dozen different states and performed a total of 85 baptisms. That was in addition to serving his own parish in Kearney, and raising his four surviving children without a wife. The Spanish flu pandemic hit the United States in 1918, and a number of Fr. Nicola’s Kearney parishioners were infected. That didn’t deter Fr. Nicola, though — he continued to minister to them, bringing them communion and hearing their confessions. You can probably guess where this is going: eventually, he caught the flu himself. It led to pneumonia, and he died on October 29, 1918. The cause of death may have been pneumonia brought on by the flu, but in reality it was a tireless devotion to his people. Few Orthodox priests in America have ever died so well. We are doing some research into the life of Fr. Nicola Yanney. The research is on-going, but we decided to print the information we have right now in the form of a timeline and a list of dates/places that Fr. Nicola visited during his missionary journeys. The list of dates/places was translated from Fr. Nicola’s sacramental records which are in Arabic and in possession of his family. This work was started quite a while ago by a parishioner from Iraq, Bob Suleiman. Bob and Fr. Nicola’s granddaughter, Minnette Steinbrink, began the translation work. But Minnette was soon diagnosed with cancer and died not long afterward. Bob’s health declined and the work stopped (he has since died), probably 12+ years ago. Recently, Fr. Nicola’s great-grandson discovered the baptismal records, and Bob’s wife, Virginia, completed the translations of the baptisms. While poking around through some old notebooks in our church office, I found a notebook that turned out to be Fr. Nicola’s records for funerals and marriages (the notebook had been recycled by another priest 50 years later, but he left Fr. Nicola’s records intact). Virginia Suleiman translated all of these records, as well. We have also looked through our local newspaper’s archives, two Yanney family histories, and several old church histories written by founding members in order to compile the timeline. We recently found out that there was more than one local paper in Kearney during Fr. Nicola’s time. There is a very detailed description of his account of St. Raphael’s funeral in one of these previously unknown (at least to me) local papers. We will look for archives of this other paper in hopes of finding more about Fr. Nicola. There are also other untranslated materials in possession of the family. And we are hoping to look at some out-of-state local newspapers now that we have a list of dates and times. There you have it! Fr. Christopher says that they will also be producing hard copies of the document. To download it in PDF, click here. I hope this will lead to further research and inquiry into the life of Fr. Nicola, who was a truly outstanding priest.